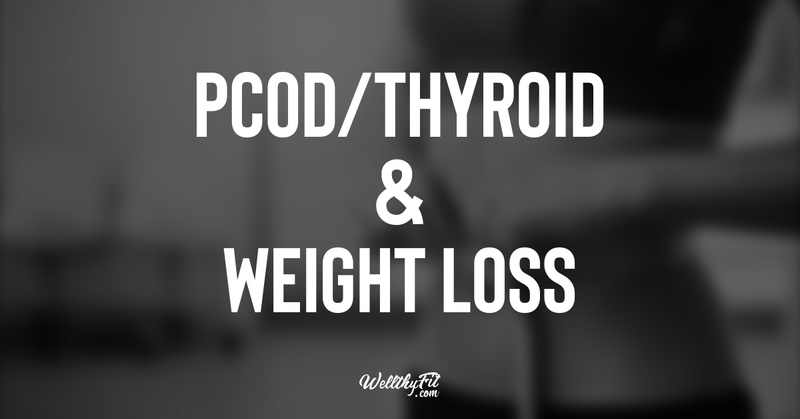 PCOD and thyroid has been the ‘bad guy’ among the weight loss population. Any problem right from the stubborn weight to fatigue, sluggishness, cholesterol, insomnia, infertility and depression – pretty much everything is linked to it. Multiple diets, varied workouts and medication nothing seems to help. Even if you did lose weight, it comes back with a bang after a few months. You have tried multiple times and given up equally. If this is you, read along. Often when conditions like PCOD, thyroid or other hormonal imbalances manifest in our body it is our body raising an alarm that we need to look into something. We almost always end up acknowledging and treating the symptoms without identifying the root cause. The following are the most common reasons why you are struck on weight loss journey. Addressing the hormonal conditions require us to think about our health holistically and not just in terms of weight loss or gain. Just sweating it out in the gym or going on fad diets alone will not help in weight loss without addressing these root causes. Take a good few days to critically look at your lifestyle and identify your pain points, not to punish yourself but to start working on it. In a quest to lose weight we beat ourselves down by quitting our favourite food, eating salads, giving up healthy fruits and vegetables like banana, cauliflower, carrots and, surviving on fruit juices, and giving up carbs. Some may even put on weight just by looking at Ghee. In order to control the calorie intake, we often sacrifice nutrition. Bananas and cauliflowers, for example, are filled with micro nutrients that help regulate thyroid hormone. However, it is not a favourite food among the weight-loss population. On the other hand, biscuits can give you calories but not nutrition. Get the flow? The key here is to eat wholesome meals and snacks to fill the gap in your nutrition and not overly concentrate on calorie intake. Include a variety of whole grains, enough protein, healthy fat and fibre in your diet. There are many apps available that will help you plan nutrition. My friend was doing it all right. Eating a well-balanced diet, exercising at least five days a week, weight training at least one or two days in a week and yet, she didn’t lose any considerable pounds for almost 9 months. My reassurances that she did looked toned just fell on deaf ears. We then found out something called as the Lean Body Mass (LBM). LBM, in plain terms, is how much your muscles weigh after taking out the weight of fat from your total body weight. The fitness centres in the US do some fancy stuffs to find out the LBM and her trainer told her the reason why she didn’t ‘lose weight’ is because she has improved her LBM while simultaneously losing body fat in the last 9 months. In other words, she did lose fat due to her workout but she also increased her muscles, which is a great thing! She was feeling healthy, active and was sleeping well. The takeaway here is not to be struck at the figures on the weighing scale. It can be misleading, frustrating and outright discouraging. Focus on being healthy. Trust your body to heal. When you feel good, wake up fresh, and are rearing to go in spite of what the weighing scale says, you know you are doing the right thing. Healing is a slow process. Accept it. There could be many reasons that avalanched to manifest into hormonal conditions. Identifying the right one, trying out different combination of fitness and diet, and the body responding to the improved lifestyle – all this takes time. Being consistent and going ahead with small improvements provides exponential results and a better health going forward. If you are planning to lose 5 kilos in 3 months for your cousin’s wedding, sorry, your body doesn’t understand your urgency. If anything, the stress to reduce weight will only pile up another kilo or two around your waist. Hi there! This is one place where we ‘all’ meet together. At any given point in time, we all have at least one person in our lives who is being a pain, you know where. If there is none, then you are wallowing in misery, self-pity or punishing yourself with your own stabbing criticism. If it’s the former, you have to learn to say NO and if it’s the latter, then you have to LET IT GO! There is never one person who bears the weight of the entire world, except maybe President Trump or Queen Elizabeth. And, trust me, they will have the best dieticians and fitness experts to worry about their hormones. You and I, don’t. So, whoever is tossing your hormones out of proportion, tell them a NO. People never change and will never give appreciation, on a sizzling platter – no matter what you say or do. So, it’s ok to say NO and LET IT GO. Nobody is perfect, celebrate the imperfect you. Depend on your consciousness for appreciation, take action rather than wallowing in pain, and proudly take responsibility for your actions. Jyothi is an active writer on Mompresso, Women's Web and Huffington post. Her areas of interest are education, relationships, parenting, health and life skills.She is currently living in the US. She is an MBA in Economics and Finance.